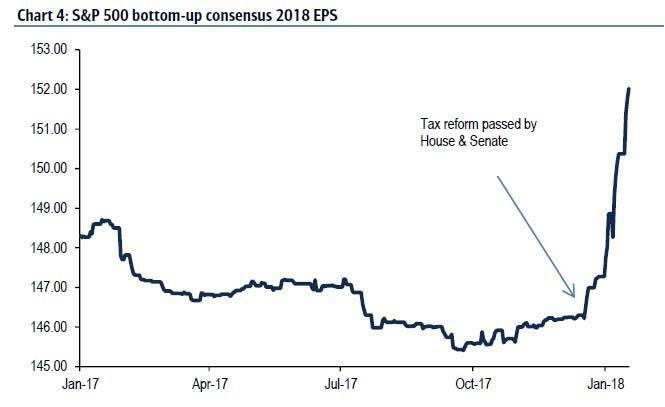 Morgan Stanley: "Tax Reform Is Now Fully Priced In"
Last week we showed that as part of the "new tax cut reality", 2018 EPS forecasts have soared in the past few weeks as analysts scrambled to boost their earnings forecasts for companies benefiting from the lower corporate tax rate. Well, as of today, that surge has made further headway, and as the latest Bank of America chart below shows, the S&P is now trading off a year end EPS forecast of roughly 152, nearly 7 points higher compared to October. Further, according to BofA estimates, the surge in year end EPS forecasts means that about 40-50% of the tax reform's benefit of $13 EPS is now backed in. That, however, has prompted more concerns out of Morgan Stanley, which as a reminder last week suggested that with S&P calls hitting an all time high, it is time to buy puts. Fast forward to today, when in a note released from Morgan Stanley's Mike Wilson, the chief equity strategist writes that he continues to hear both clients and commentators suggest that tax cuts have not been priced and the powerful extension of the rally the past few weeks has only emboldened those with that view. Morgan Stanley then admits that "we have been surprised at how fast forward EPS estimates have moved up post the signing of the tax deal. We thought it would be more gradual as companies hesitated to provide clear and detailed guidance on how tax would affect 2018 EPS, or indicated that it might not be as exciting as some were hoping--like FAST and AXP." 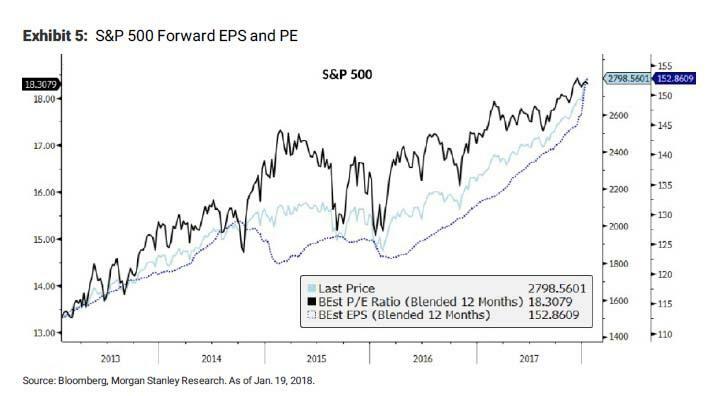 Furthermore, as a counter to Bank of America, the exhibit below from Morgan Stanley shows "just how much has now been discounted with the almost parabolic move higher in forward S&P EPS from $145 to $152 in just 3 weeks." We have no beef with this increase and is generally in line with our estimate that tax cuts would add somewhere between $5-10 per share to S&P 2018 EPS. However, we are skeptical it will exceed $155 when all is said and done. Meanwhile, the multiple has also been rising suggesting the market is now expecting a further rise toward $155 or higher. And to underscore his bearish take on the ongoing meltup, Morgan Stanley's strategist writes that this strongly suggests that the "tax is fully priced, especially if one agrees with our view that multiples are likely to fall when the earnings revisions stop rising and investors recognize it's lower quality growth and they are staring at a massive deceleration in 2019--$155 2018 EPS implies close to 17% y/y growth. Based on that, we are hard pressed to see much more than 5% earnings growth in 2019 even if the late cycle economic expansion continues; hardly a foregone conclusion in our view."